French court gunsmith Marin le Bourgeoys made the first firearm incorporating a true flintlock mechanism for King Louis XIII shortly after his accession to the throne in 1610. 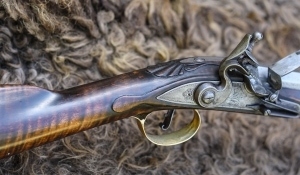 The development of firearm lock mechanisms had proceeded from matchlock to wheellock to snaplock to snaphance and miquelet in the previous two centuries, and each type had been an improvement, contributing some design features which were useful. Le Bourgeoys fitted these various features together to create the flintlock mechanism. The new system quickly became popular, and was known and used in various forms throughout Europe by 1630. In particular, dragoons serving with the Parliamentarian army in the English Civil War were known to use snaphaunce muskets, or early forms of flintlocks. Examples of early flintlock weapons can be seen in the painting “Marie de’ Medici as Bellona” by Rubens (painted around 1622-25). One of the more successful was the system built by Isaac de la Chaumette starting in 1704. The barrel could be opened by 3 revolutions of the triggerguard, to which it was attached. The plug stayed attached to the barrel and the ball and powder were loaded from the top. This system was improved in the 1770s by Colonel Patrick Ferguson and 100 experimental rifles used in the American Revolutionary War. 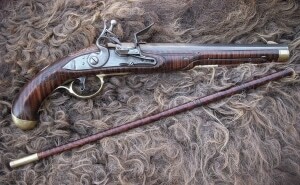 The only two flintlock breechloaders to be produced in quantity were the Hall and the Crespi. The first was invented by John Hall and patented c. 1817. 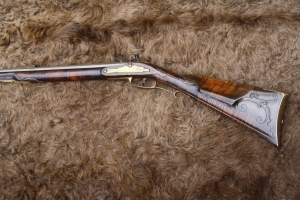 It was issued to the U.S Army as the Model 1819 Hall Breech Loading Rifle.